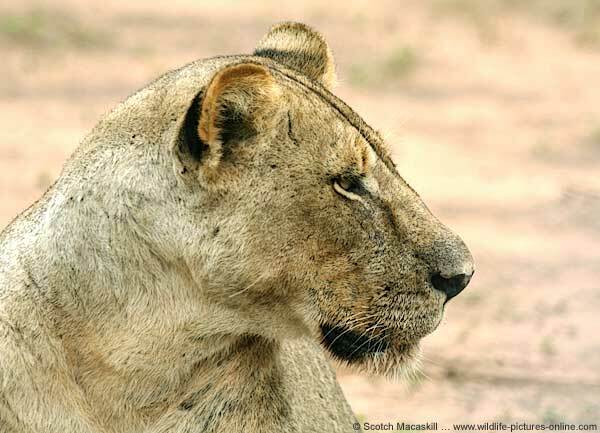 Caption: Lioness (Panthera leo) close up, showing her head in profile, Mashatu Game Reserve, Botswana. © Scotch Macaskill. Camera: Canon EOS 350D digital SLR and Canon EF 100-400mm f/4.5-5.6L IS USM telephoto zoom lens. Exposure: 1/250 sec at f/5.6; ISO: 400; Lens focal length: 310mm. Additional Info: This image of an alert lioness was taken on a cloudy day in Mashatu Game Reserve, a 26,000ha reserve lying in the remote eastern corner of Botswana known as the Tuli Block.